Our eighth day exploring the Ring Road of Iceland was a rather impressive day, including stops at the famous Jökulsárlón(the “Glacier Lagoon”) and Svartifoss (the “Black Waterfall”, an impressive waterfall in front of a backdrop of basalt columns), along with plentiful hiking and a stop for Jöklaís (“Glacier Ice”) ice cream. It was yet another busy day of sightseeing, hiking, and driving, and we ended up pulling into our destination, Kirkjubæjarklaustur (whose name is ponderous even by local standards, we noticed that most folks call it simply “Klaustur”), at a fairly late hour looking for dinner. Well, Kirkjubæjarklaustur doesn’t have a heck of a lot to offer. While having some nice features in itself, like a waterfall, and some really interesting basalt columns), Klaustur’s main attraction is location: it’s pretty much the only settlement on the southern coast between Vík and Höfn which offers services, including the ever-present N1 station, a few modest hotels, and the like. Heck, there’s basically three places to eat (the hotel, the gas station, and the cafe). After perusing the menus of each, we ended up choosing the cafe: Systrakaffi (if you were hoping for the N1 gas station, don’t worry, I’ll get to them in a few reviews). A quick step into Systrakaffi (“The Sisters Cafe”) shows that it’s a modest small town restaurant/cafe, and it has generally the sort of menu you’d expect from a small town Icelandic cafe (or at least what you’d come to expect after more than a week exploring rural Iceland): a variety of soups, salads, pasta dishes, many lamb dishes, a few other main dishes, and some pizzas. Basically, a little bit of something for everyone… and most everyone in town seemed to be eating here, from other map-toting tourists representing most of the EU, to local farmers looking for something on the simple end of “dining out”, and even one of the Reykjavik Tours bus drivers. 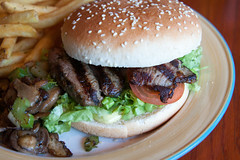 The staff was friendly and efficient, and quickly had us seated at a table with English menus. Somewhat predictably, the special was “lamb with Bearnaise sauce” (this was a dish on about 95% of menus I saw in Iceland, since in addition to their love of Lamb, apparently most Icelandic folk also like a good Bearnaise sauce), which lured Carol in. 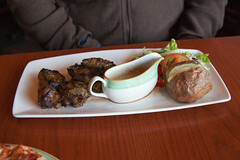 We definitely had better lamb a few places, but this wasn’t a slouch, it was a nicely seared series of tender chunks of lamb, served up with baked potato and salad, with a small gravy boat of bearnaise sauce. Particularly for the price, it was rather decent. Myself, I went for the lamb burger with fries, which was basically a burger with the same grilled lamb as Carol’s main, served up on a bun with lettuce, tomato, and “special sauce”. Wwhen ordering this, I wasn’t 100% sure if this was going to be ground lamb, or whole lamb, and was actually a bit pleased that it was the latter, this made for a good sandwich. The fries weren’t half bad, either. But the whole reason I decided to write up Systrakaffi was a little menu item that caught my eye right as I was finalizing my order: the “Icelandic Cheese Pizza”. I’m not generally a fan of “novelty” pizza toppings, but in this case I had a hard time resisting, so we ordered a small one. 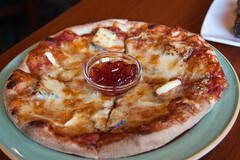 About 15 minutes later, they delivered it: a nice ~9″ pizza, with a really nicely seared crust, a thick layer of cheese made from four different varieties of Icelandic cheese, and a little bowl of redcurrant jelly. A rather odd combination, but one that actually worked really well. All four cheeses were fairly strong in flavor (what I normally call “stinky cheese”), but the combination of partial melting and searing from the oven made these really pleasant in both flavor and texture, much like a baked brie. The redcurrant jam was also a nice touch, giving it a little bit of tang and sweetness. But my biggest surprise was the crust. Usually in little places like this that have all sorts of menu items but pizza, the pizza is an afterthought, and you usually get some sort of decent-but-not great crust. But here it had everything I look for from a good crust: a nice chewy texture, a good browned crown on it, and a nicely toasted bottom. This was a really good pizza crust, and I suspect most of the rest of their pizzas are quite as good as the Icelandic Cheese Pizza. Next time I’m there, I’ll try it out. You’re right the crust does look good, and I think I’d enjoy the cheese combo. Nice write-up, and you’ve made me very jealous!